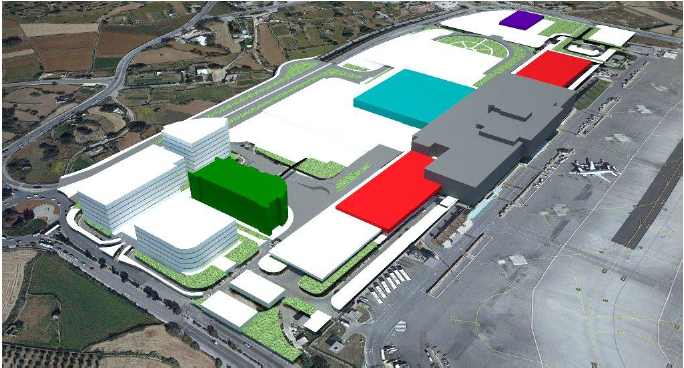 Earlier this week, the management of Malta’s International Airport announced a €78 million investment programme, aimed at enlarging the terminal buildings, improving and upgrading existing facilities for the handling of passengers and further developing a business hub. The airport terminal at Gudja is Malta’s only such facility and so, to a certain extent, the further development of the existing capacity to handle the arrival and departure of passengers is essential. And yet, due to the limitations of size, the proximity of Gudja’s airport to the surrounding villages of Luqa, Gudja, Kirkop and Safi has to be borne in mind. Size limitations signify that even essential works will have an impact on the surrounding communities and thus have to be thought out carefully. Its been over five years since MEPA has received a planning application for the consideration of an updated master-plan for Malta International Airport. PA5548/10 was submitted in November 2010. A previous version of the master-plan was approved in 1997 (PA5681/96) while another version, submitted in 2003 (PA5306/03), was withdrawn. The latest proposed master-plan currently under consideration by MEPA includes provision for the enlargement of the terminal building to include additional facilities to handle passenger traffic as well as the construction of five new buildings for a range of commercial and leisure activities. The masterplan was fed by two studies commissioned by the Malta International Airport. The first – carried out by Locum Consulting – studied the office market in Malta and apparently concluded that the “high quality office stock supply” is limited in comparison to the existing demand. An audit of the proposed masterplan was also carried out by Eriksson + Partner GmbH. The EPS contains selective quotes from these two reports, but the reports themselves have not been made public. Both MEPA and MIA have resisted requests to publish these reports as they consider that they are commercial reports and do not contain information on environmental impact. Malta’s only airport has its requirements. In particular, it needs to cater for the increasing number of passengers it handles. This year, the number of passengers handled has recently surpassed the 4.5 million mark. It will undoubtedly continue to rise and it stands to reason that the passenger-handling facilties, currently bursting at the seams, need to be upgraded. What number of passengers is being planned for? What are the forecasts ? This information is not available as part of the documentation which has been published to date. The inevitable increase in the number of passengers to be handled by MIA will have an impact on the surrounding area. The traffic generated, and the emissions associated with this, will further deteriorate the air quality in the main roads leading to Gudja. There will also be an increase in noise pollution. The Environment Planning Statement identified the Ħal-Farruġ Road/Qormi Road roundabout at Luqa as requiring upgrading as a result of long-term traffic projections made. It did not, however, identify any other major traffic impact on the villages surrounding the airport. In particular, the EPS did not consider it relevant to consider that already, at this point in time, the residential area of Gudja – less than 50 metres away from the boundary of the airport carpark – is being used by airport employees and passengers as an additional carpark, thereby creating an unnecessary burden on Gudja itself. The current burden for the airport’s core functions, and the first phase of the Skyparks project, are primarily being borne by the communities of Luqa, Gudja, Kirkop and Safi. Additional impact due to an increase in the airport’s core functions is unavoidable. But making matters worse through further development of the airport as a business hub is verging on sadistic. Gudja’s airport should not be compared to major airports when determining long-term functions, but rather to regional airports. Given Malta’s size, practically all facilities are available within a 15-minute drive from the airport. It would hence make sense for the airport’s management to realise that the airport’s corporate social responsibility should not be limited to funding some restoration projects. It is about time that it focused on the fact that human beings reside in the surrounding villages. The airport’s contribution to Malta’s economic performance is welcome but this should not be at the expense of the quality of life of the surrounding communities.